Dress up your classic egg salad by adding fresh herbs and creamy avocado. There's no need for mayonnaise at all, since avocado creates the perfect smooth and creamy base. It's brightened up with fresh herbs and some lemon juice to make a simple, yet sophisticated dish. Egg salad is incredibly simple to whip up. If you make the hard-boiled eggs ahead of time you can have this dish on the table in less than five minutes as a last-minute party appetizer. It's a great idea to make your hard-boiled eggs in large batches and then give them time to chill ahead of time. Served as a dip or sandwich spread, it's hard to go wrong with this fresh and tasty twist on egg salad. Slice open the eggs to make sure the yolks are cooked—you want them to be pale yellow and crumbly. If you follow our hard-boiled egg tutorial, you can achieve perfect 12 minute hard-boiled eggs with ease. Dice the hard-boiled eggs as finely as you'd like. Mash the avocado in a medium-sized bowl. Leave it as chunky or as smooth as you want. Mix in the lemon juice, salt, and olive oil. 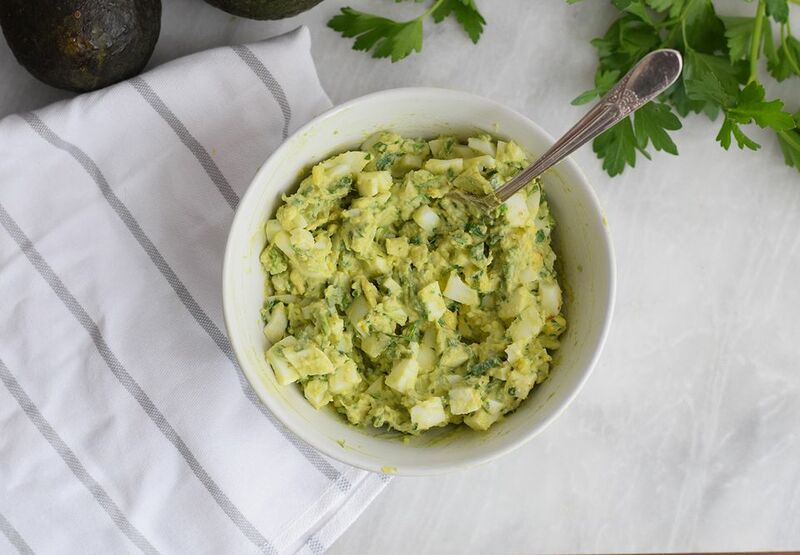 Add the chopped egg, parsley, and chives to the avocado mixture. If you're adding mayonnaise, you can add it now as well. Gently fold all of the ingredients together and season with salt and pepper to taste. You can serve it as a dip or spread, or of course, in a sandwich! Use our hard-boiled egg tutorial to get the best results for your hard-boiled eggs—no gray or green yolks and easy peeling. Make sure to choose fresh ripe avocados. Make sure they aren't brown on the inside, or you won't achieve this beautiful green egg salad. If you need to get your avocados ripened quickly, then follow these tips. Keep this salad fresh and green by placing plastic wrap directly on top of the egg salad. Smooth it out and try to get all of the air out from under the wrap. This will help keep it from turning brown. You can change up the herbs in this recipe to your liking. Try scallions, cilantro, or a mix of all of them. Even basil can be delicious. Just make sure to find fresh, bright green herbs. Wash them thoroughly and chop them up finely, so that they can be evenly distributed throughout the egg salad. There are so many ways to serve this egg salad. Chop the eggs finely and serve them on toast points or crackers. You can also leave is as a spread or pile it between bread. Add some fresh greens, and tomato for a complete sandwich.